The Exerpeutic WORKFIT 1000 Desk Station Folding Bike is not only an exercise bike but also you can use the desk top as a work platform for your laptop, your favorite book, iPad, Smartphone or whatever device you choose. No more sedentary sitting at a desk when you can exercise and get healthy while working. It features the state of the art high torque 3 piece torque crank system, heart pulse monitoring and a "double drive" transmission system. You can burn those calories while you work, read or just watching a movie on your tablet. Cruise the internet, check and reply to your emails without changing your schedule or work routine. 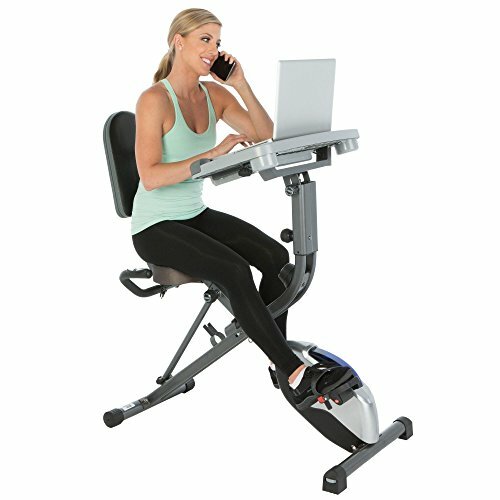 The Exerpeutic 1000 Desk Station Exercise Bike folds easily and can be relocated using the built in transportation wheels. The benefits of work/exercise can improve your mental alertness, heighten creativity, fight depression, burn calories, tone muscles and just improve your overall well being. Features: Adjustable Height Leg Stabilizers: Prevent any shaking or tipping when exercising. Durable powder coated steel frame construction. Heart Rate: Hand Pulse Sensors for monitoring your heart rate. Quiet Belt Drive System: The precision balanced flywheel and V- belt drive provide a smooth and quiet operation. It will not interfere with watching TV or listening to music. Safety: A larger pedal design with safety straps prevents any foot slippage when exercising. Desk Top Features: 3 angle adjustable desk top 0 Degree (level) , 16 Degree and 33 Degree. 5 height adjustments 41" up to 45". Exclusive AIRSOFT seat: 11"L X 15"W. 2.5" Thick foam. The AIRSOFT Seat is large and oversized, using aerodynamic healthcare technology allowing air to breathe through the fabric. The seat will remain cool after many hours of use. Large cushioned backrest: 151/2"H X 111/4"W. 1 1/4" Thick foam. All batteries included (2 AAA). Laptop, iPad and dumbbell not included. Product Set Up Dimensions: 451/4"L x 25"W x 511/4"H. Product Weight: 64.7 lbs, Assembly Required. Warranty: 3 years.